The Firm has been selected as one of the "Best Law Firms for Insurance and Personal Injury Defense" by Best Lawyers and U.S. News and World Report, and has been selected an "All Star Go-To Law Firm" by Corporate Counsel magazine for our representation of Fortune 500 clients. Our practice is devoted entirely to litigation, with an emphasis upon insurance and corporate defense. We offer expertise not only in significant individual cases, but also in complex litigation, including class actions and Multidistrict Panel litigation. We are admitted to practice before the Courts of Ohio, California, Florida, Georgia, Illinois, Kentucky, Maryland, Missouri, North Carolina, Pennsylvania, South Carolina, West Virginia and the District of Columbia, and have been actively engaged in major litigation in state, federal and administrative forums in the states of Arizona, Arkansas, California, Colorado, Florida, Georgia, Illinois, Indiana, Kansas, Kentucky, Louisiana, Maryland, Michigan, New Jersey, New York, North Carolina, Ohio, Pennsylvania, South Carolina, Virginia, West Virginia, and the District of Columbia. 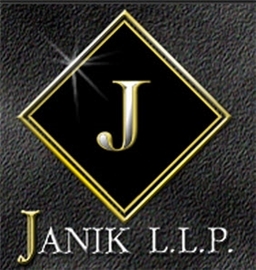 The law office of Janik L.L.P. will represent your intellectual property legal matters. The firm's business litigation practice includes cases that involve employers, directors and officers, broker dealers, registered representatives, intellectual property, financial institutions, insurance agents, real estate agents, title insurance, commercial lending and collection practices, corporations, joint venturers, partnerships, and sole proprietors. Steven G. Janik is the founder and Managing Partner of Janik L.L.P. Steve is admitted to practice before the State and Federal Courts for California, Georgia, Kentucky, Maryland, Missouri, North Carolina, Ohio, Pennsylvania, South Carolina, Texas, West Virginia and the District of Columbia as well as the United States Tax Court and the United States Supreme Court. Steve is a member of the California, Kentucky, Maryland, Missouri, North Carolina, Ohio, Pennsylvania, South Carolina, District of Columbia, Federal, American and Lawyer-Pilot Bar Associations. Steve has served as Special Master to the United States District Court, Northern District of Ohio, in complex antitrust and asbestos litigation proceedings, as a member of the Federal Judicial Center Task Force on Reducing Trial Delay, and as Chairman of the Magistrate Merit Selection Committee, United States District Court for The Northern District of Ohio. Steve is a life member of the Sixth Circuit and Ohio Court of Appeals Judicial Conferences. He is also a member of the International Association of Defense Counsel, Defense Research Institute, and the American College of Coverage and Extracontractual Counsel. Steve has served as a member of the Orthopedics Leadership Board of the Cleveland Clinic Foundation and is a private pilot, single engine land, instrument rated. Steve is listed in The Best Lawyers In America, Ohio "Super Lawyers", and Cleveland's Best Lawyers for Commercial Litigation, Insurance Law, and Personal Injury Litigation.